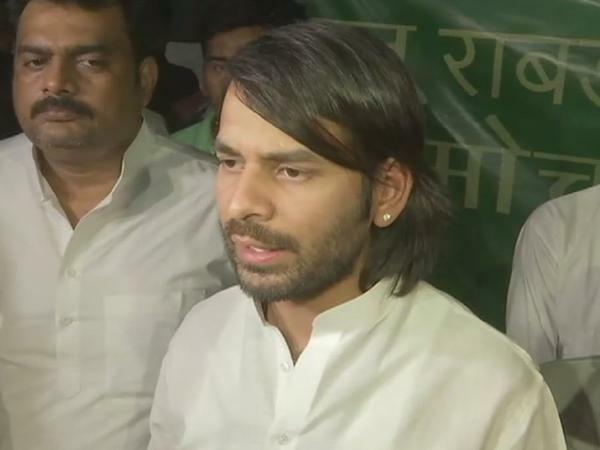 Patna, April 9 : RJD chief Lalu Prasad's elder son Tej Pratap Yadav on Tuesday expressed displeasure over his younger brother Tejashwi Yadav's decision to field a candidate of his choice from the Sheohar Lok Sabha seat. He also warned that if Tejashwi will not consider his demand then two of his supporters will contest against the Rashtriya Janata Dal as Independent candidates. The RJD has fielded a journalist-turned-politician Syed Faisal Ali from the Sheohar seat while Tej Pratap was in favour of Angesh Singh. "If Tejashwi will not reconsider his decision over Sheohar, two of my supporters would contest as Independent candidates from the Sheohar and Jehanabad Lok Sabha seats," Tej Pratap told the media here. The former Health Minister said that Tejashwi is not taking his advice now as he has been surrounded by sycophants. Tej Pratap also questioned Tejashwi's decision to field Ali. "I have inputs that the RJD candidate fielded from Sheohar is close to the BJP. It is a wrong decision," he said. Interestingly, Tej Pratap took a U-turn on his earlier announcement to contest the election against Chandrika Rai, the father of his estranged wife and the RJD candidate, from the Saran constituency. "I will not contest against Chandrika Rai. I have nothing to do with him," he said. The seven-phase election in Bihar is scheduled from April 11 to May 19. Polling for the Sheohar seat will take place in the sixth-phase on May 12.